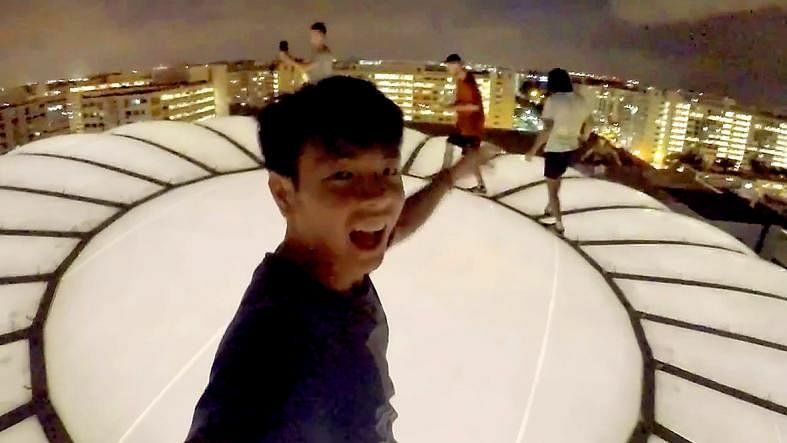 SINGAPORE (THE NEW PAPER) - A group of parkour enthusiasts who performed stunts such as scaling the glass dome roof of Eastpoint Mall in Simei and walking on top of railings on a Pan-Island Expressway (PIE) flyover could be reported to the police. A video of their stunts was posted on Facebook and YouTube by Denester on Aug 16. 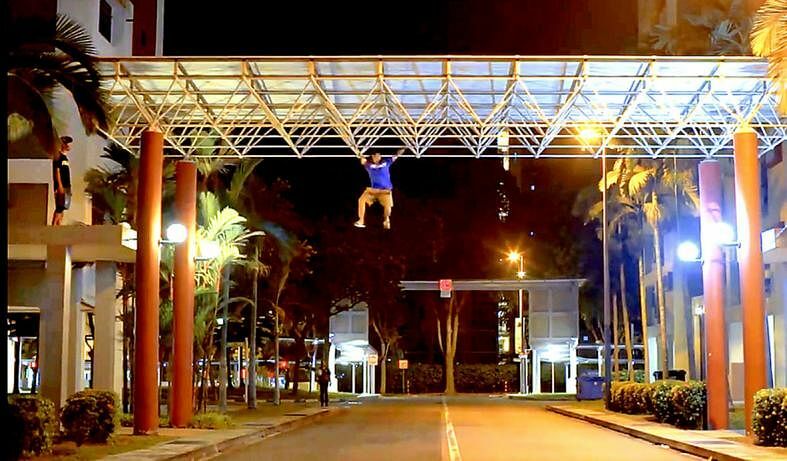 Titled "Simei Training 4", it shows five men performing parkour in Simei at night. One of them can be seen swinging from bars to cross a two-storey-high shelter between two HDB blocks. A lawyer told The New Paper that the group had committed multiple offences, including trespass, while a spokesman for the East Coast-Fengshan Town Council said it will be making a police report against them. A spokesman for Eastpoint Mall told TNP that it would be reinforcing security measures. "We take a serious view against any acts of mischief that endanger the safety of those involved and others around them," he said. "The roof area at Eastpoint Mall is not designed for any activities, and it is strictly out of bounds to the public. Anyone caught trespassing into out-of-bounds areas will be handed to the police." TNP understands that the mall management is investigating if the group had scaled the facade of the building to gain access to the roof. Denester's real name is Mr Koh Chen Pin. The 23-year-old posted a picture of himself standing on the glass dome roof on his Instagram page under the handle "deeenester" on Feb 22. When contacted by TNP, he said he would not comment because he did not want to invite unnecessary police attention. Asked why he had uploaded the video then, he said the situation would be different without media attention. Facebook user Travinder Singh, commenting on the video, called the stunts "dangerous and illegal", but others called the video "awesome". The video was taken down on Wednesday. Criminal lawyer James Ow Yong, of Kalco Law, said the men could have broken several laws under the Miscellaneous Offences (Public Order and Nuisance) Act. He said: "Practising parkour in public may amount to disorderly behaviour if it disrupts public order. "Walking on the PIE railings and using the shelter as monkey bars can cause undue disruption and alarm to the public. Scaling the roof of Eastpoint Mall is probably wilful trespass." Should someone get hurt, they may also be liable under the Penal Code. For disrupting public order, they can be jailed up to six months, fined up to $2,000, or both. For wilful trespass, they can be fined up to $1,000.